1. What made you want to become a goalkeeper? I wanted to be a keeper when I was young because it was where all the action seemed to be and I loved the gloves! Growing up, I loved Tim Flowers. He was top keeper at a club that was local to me, and I really looked up to him. I had the pleasure of him being my coach last season too, which was brilliant. 3. What's your favorite or most memorable save? Best save, I really can't remember! 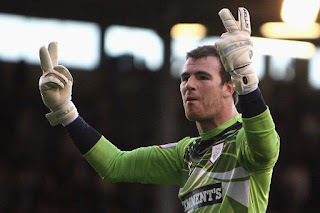 There's a few that stand out for importance, but then from a technical point, I made a save at Huddersfield for Fulham last season that I was pretty pleased with. 4. What's your all-time favorite glove? I'm a Sells guy, so any of the Sells range are outstanding. But apart from that, the Uhlsport which Tim Flowers had - red and blue - were ones I used to beg my mum and dad for for Christmas! 5. Which current goalkeeper do you mot enjoy watching? I'm a massive fan of Petr Cech. He's just the complete keeper. I like everything about his game, and also I've met him a few times and he's a great guy. Also Lloris, Courtois, and Jan Oblak at Atletico Madrid are also brilliant. Massive thanks for Andy for taking time to answer my questions!